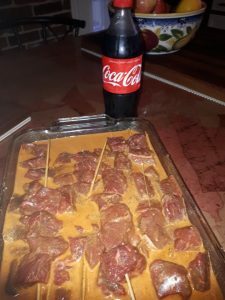 Grill, and Marinate with Coke. Coke as a marinade, really, why not Root beer, or 7 UP? Why not, soda’s make a great accompaniment to your marinate or even to a braise. 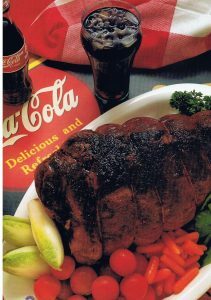 Coke has essences of vanilla, citrus, and cinnamon while Root beer combines anise, wintergreen, licorice and other flavors such as sarsaparilla which has replaced sassafras (now considered a health risk), these flavors enhance savory cooking, particularly barbecue. It is all in the PH balance of the marinade, most common meat marinades have a pH from 2.1 to 4.5, with lemon coming in as the most acidic at 2.1 and vinegar at 3-4 pH. Coca-Cola had a pH of 2.53, so it is great as a marinade. It is this Phosphoric acid in the soda that will help to break down the tough tissue in meat, and, no, your meat will not dissolve away as the urban myth makes the claim. Forget the beer unless your wanting the flavor beer provides, it just doesn’t do the job of tenderizing as a bottle of soda will. There are a few simple rules that every great grill master has mastered some basic unbreakable rules for grilling. They may seem simple, but forget them and you face a possible downfall, poor quality food presentation or even worse food that is not edible. First be sure you have enough fuel, charcoal is best, so be sure to have good quality charcoal or briquettes on hand. Usually 6 quarts of charcoal will see you through, use 30 briquettes to cook 1 pound of meat. Be sure you select a high quality charcoal made from burning high quality woods in the absence of oxygen, so it will light quicker, burn hotter, gives a nice smoky flavor and leaves little ash. Briquettes on the other hand, are less expensive, easily found gives an even temperature. Made from wood by products they tend to need chemicals to burn and therefore need to be burned off to begin with otherwise the chemicals will enter your food and taste like fuel not the flavor you’ll desire. However, they tend to maintain temperature longer than lump charcoal. Time is also very important 30-40 minutes are required to create a proper ash layer which gives you the even temperature you require. Look for grey ash spread over the briquettes a good indication, it is time to get cooking. Secondly, be sure your grill is clean. Pieces of black carbon burned onto the grill will cause your proteins to stick to the grill and give your products a bitter burnt taste. A clean grill is not only important for the presentation of your food, but more vitally for the final flavor of your meal. Judging the temperature of your grill may be a little tricky if you do not have a grill thermometer (you really should have one) so to judge temperature without one use this method. Stay committed, once you begin pay close attention to your grill. This open flame should never be left unattended. Any one of many factors can cause flare up’s and ruin your food. Stay involved, it is your dinner on that grill. Want the extra flavor of mesquite, hickory or maple soak the wood chips in water before placing them over the hot coals. Flare ups will instantly burn your food so avoid using anything which would cause such flare ups. A common mistake which causes flare ups, are sugary sauces (most BBQ sauces) basting with such sauces should be done only during the last ten minutes of cooking. The sugars burn easily and that will ruin your meal as well. Every good cook needs a good instant read thermometer. Okay so you don’t have an instant read thermometer how do you tell what the temperature of your steak is? An old restaurant trick is called the touch method. Use the index finger of your right hand, press down on the various areas of your left hand then press down on your grilling steak. The tenderness of that area (as in the illustration above) will give you a very close indication of the steak temperature. Clams, Mussels & Oysters cook to the point at which their shells open – throw away any that do not open. In a mixing bowl, combine all the ingredients except the steaks in a small mixing bowl. Place the steaks in a shallow baking dish, spoon the mixture over the steaks and press into the meat with the back of the spoon. 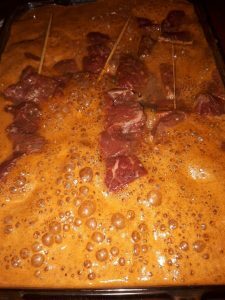 The marinate will get very bubbly when poured over the meat. Cover and refrigerate for 3-4 hours. Grill over medium heat to desired doneness.